Last year toward the end of December when the holiday rush was winding down, I made a couple of paper craft projects I'd been itching to do all season long. 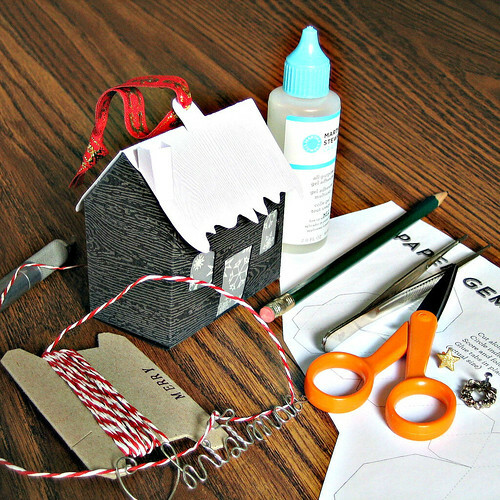 These little paper houses were tops on my list. 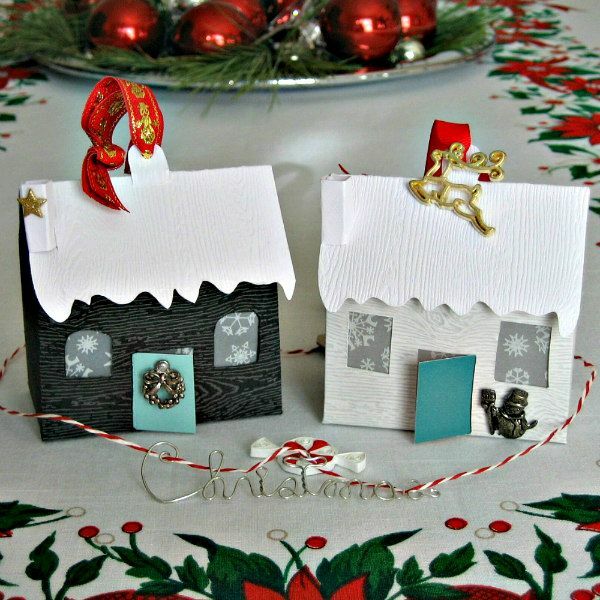 I'd noticed handmade dioramas of decorated rooms on Etsy in the lead up to Christmas and was excited to see the creator, paper engineer Helen Friel, featured on the Etsy UK blog. 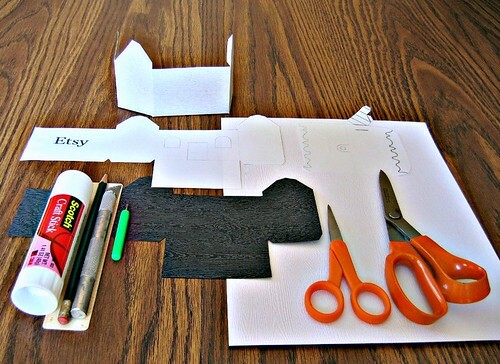 Not only that, but the post included a template provided by her to make an irresistible tiny house... thanks Helen! The elf-sized cottages were very fun to construct and didn't take long at all. You just print, cut, fold and glue. The 3D chimney is already attached and slips perfectly into place. 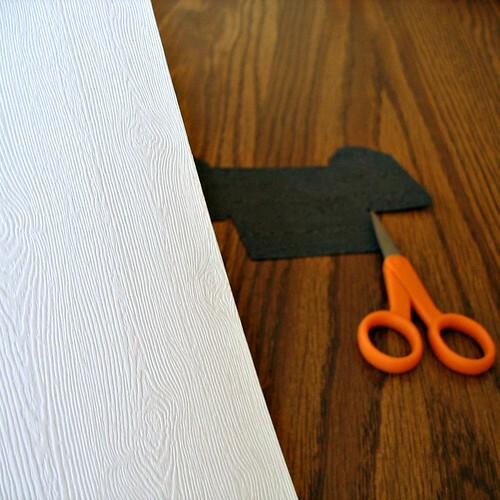 I used Gmund's wood grain card stock from LCI Paper to give an authentic clapboard look. It's available in textured, neutral shades, just right for home building. Another neat thing is that the houses provided me with a way to finally use little decorations that have been in my craft stash for ages. 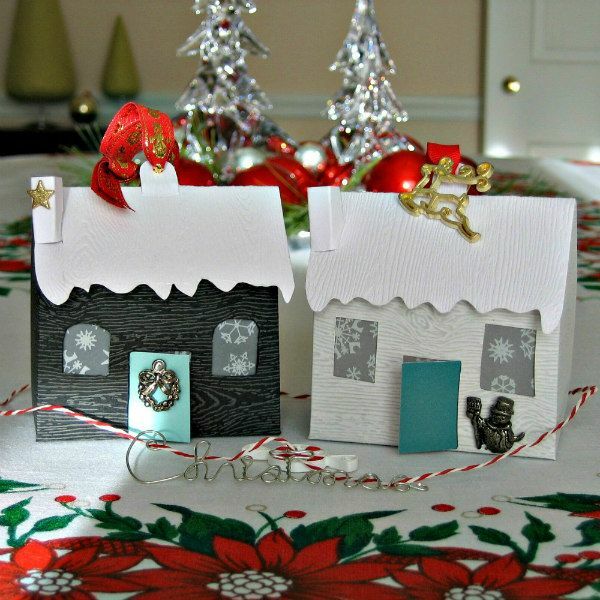 Denise Cameron, owner of Custom Quilling, had sent them to me back in the day when, as a member of her design team, I would create projects for a monthly newsletter. Denise always made sure the team had inspiring choices, and in the back of my mind I knew to save every bit and bob as surely they would come in handy someday. Things like snowflake vellum, snowman ribbon, metallic charms, glittery pins and even a Christmas wire-word upped the cuteness factor. My paper cutting skills are rudimentary at best and I used a practically antique craft knife that belonged to my husband's grandfather... thus the somewhat wonky doors and windows. Ah well, it's all part of the charm, right? I'm better with scissors, so used a small pair to trim the snowy roof curves. Red and white paper twine from PaperPhine and a little quilled peppermint completed my tabletop vignette. I'm looking forward to getting them out again this year... yikes, it's already December 1st and time to start decorating! 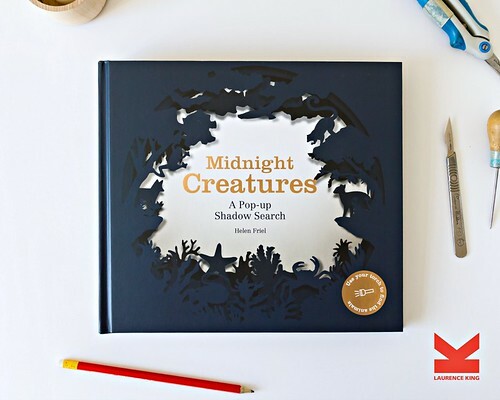 Back to Helen Friel... earlier this fall I was sent a copy of her handsome new book published by Laurence King, Midnight Creatures - A Pop-Up Shadow Search. I immediately handed it off to a relative who has a four year old so they could test it out at bedtime. You see, you use a flashlight - your phone will work best - to shine through the standing cut-outs onto the ceiling or wall in a darkened room. Hunt for the animals together... some are quite exotic, not to mention very good at hiding... it's safe to say you'll both be challenged. 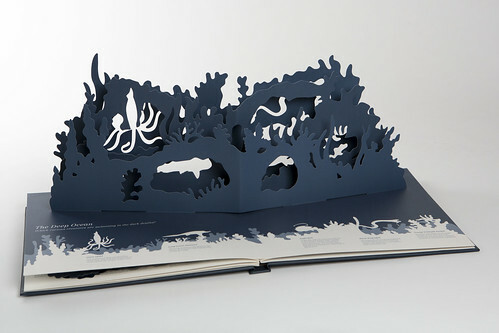 This is a title that will appeal to older children and collectors of pop-up books. One more thing for today, paper artist Helen Hiebert just launched 25 Days of Paper on her blog and shared an introductory project from her Twelve Months of Paper Calendar - it's a pop-up paper tree. Perhaps make a few to go along with your tiny houses! Looks like I'm going to be cutting houses today. Thank you for the share. I'm glad they appeal to you too, Traci - have fun! You're welcome, Alisa! Happy making.